The Leckey Mygo Stander encourages a natural standing posture with improved function. Available in two sizes. Size 1 for ages 4-10, and Size 2 for ages 8-14. Three-in-one Supine, Prone and Upright stander with continuous angle adjustment from vertical to 10 degrees from horizontal. Knee and foot supports adjust to accommodate up to 25 degree fixed hip and knee contractures. Breathable, machine washable covers are available in orange, blue, pink and black. Wrap around flexible chest laterals support the upper body in either prone, upright or supine standing with minimum obstruction. The ergonomically designed chest pad replicates the shape of the rib cage allowing the shoulder girdle to freely protract and retract in prone standing, improving upper body function. Call 604-821-0075 or request details about the Leckey Mygo Stander using the form below. 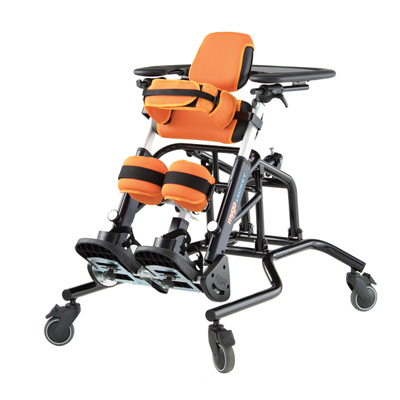 Question about the Leckey Mygo Stander ?